Dr. Heath is the Program Director for Human Development and Family Studies at APU. Dr. Ratliff is the Program Director of the M.Ed. in School Counseling at APU. Families experience enormous amounts of stress when one parent goes off to war. Rules and boundaries change, chores may be divided up differently, and loyalties are renegotiated. As the reality of a partner’s deployment sinks in, the remaining parent may find it hard to function, since he or she is suffering a significant upheaval and loss of support. Eventually, though, most non-deployed parents find ways to cope. They learn new skills, find new social groups, and establish new routines. Yet most eagerly await the return of their partner, and children, especially, look forward to a return to normalcy. The returning soldier’s reunion with their family is often fraught with difficulty. Deployment often changes people, sometimes temporarily and sometimes permanently. Children anticipating the return of the daddy they love may be confused and disappointed that he has changed. In a few cases, where PTSD is present, the change may result in secondary trauma for the child. Secondary trauma occurs when a person who did not experience the initial trauma is himself traumatized by involvement with the person who was directly involved in the hardship. The phenomenon was first noted in crisis workers who arrived on the scene after a devastating natural disaster or brutal crime. Just by listening to the victims’ stories, and seeing the aftermath of disaster, crisis workers often exhibited signs of trauma similar to those who were actually there. A child’s dream of a happy reunion can be shattered when daddy’s behaviors are strange or frightening. A child used to finding support in mommy’s arms may be further traumatized by finding that mommy is also upset and confused. PTSD pervades the entire family as hopes and expectations about daddy’s return are not met, and the longed-for return to normalcy never occurs. In fact, the child can also begin to experience severe reactions that indicate secondary trauma. Young children might regress and begin to engage in previous behaviors like bed-wetting. Older children might develop symptoms of depression and anxiety. Parents experiencing this family upheaval usually want to help children through this difficult time, but often find it difficult to wade through their own stress to be effective and compassionate parents. After working with military families through all stages of deployment, we noticed children cope with their new “normal” depending on how well the parents cope with the stress and challenges occurring after deployment. From my observations, children who adjusted to this new normal without significant distress had parents who used effective self-care strategies and coping skills. Children are aware of the anxiety, fear, and insecurity of their parents and this creates a sense of fear and anxiety for the child, which can develop into secondary PTSD symptoms. When parents are calm and communicate a positive outlook on the new situation, then this may foster resilience in the child. For this reason, parents need to be attentive and seek out support for their own emotional needs first, which will benefit the child long-term. Although post-deployment brings many possible changes and dynamics for the family, there are some things parents can do to help the child cope and possibly lessen the chance for secondary trauma. 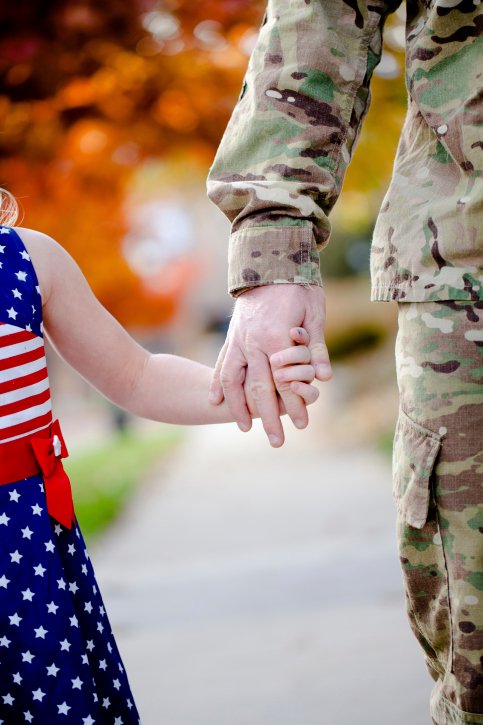 Working with military dependent children for several years, we noticed several trends that appeared to work well in the reintegration process. Those who seemed to cope well had parents who sought out their own emotional support system, communicated pride in the parent who had been deployed (e.g., saying daddy or mommy is a hero), maintained regular routines as much as possible and modeled effective ways to handle the added stressors during and after deployment. Additionally, parents who maintain their emotional health during and after deployment communicate more effectively with the child, provide a sense of security when their child asks difficult questions, and are able to take care of themselves in the midst of things they cannot control. H – Help yourself. Be sure to take care of your own emotional needs to reduce the impact of stress on the child. Use self-care strategies, such as exercise, a hobby you enjoy, relaxation strategies, etc. and demonstrate these self-care strategies for your child. E – Engage resources and support systems. It is okay to ask for help and seek out programs and others that can provide a sense of support. R – Routines. Minimize major changes to routines as much as possible. O – Open communication. Listen to your child and have open communication about the changes that are taking place. Communicating a sense of understanding and a positive outlook can be reassuring to a child. Dr. Nancy Heath holds a Ph.D. in Child Development and Family Studies and works as Program Director for the Child and Family Development program at American Public University. She is a licensed Marriage and Family therapist and a Disaster Mental Health volunteer for the Red Cross. Dr. Heath works extensively with deployed soldiers and their spouses through American Public University. Dr. Kimberlee Ratliff is a National Certified Counselor (NCC), National Certified School Counselor (NCSC), and Trauma and Loss School Specialist (TLC Institute). She is currently the Program Director and Associate Professor of the M.Ed. School Counseling Program at American Public University (APU). Dr. Ratliff served as a professional school counselor in North Carolina and Northern Virginia for 12 years and had the opportunity to work with many military children and families. She is also a former military child and has been a military spouse for nearly 20 years.